Working with papers at a computer makes you twist and strain. 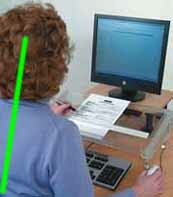 An in-line sloped writing surface insures good posture. 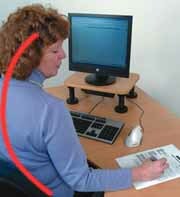 Reduce neck and back strain and unclutter your desk. In-line placement of a writing platform behind your keyboard allows you to type and write at the same time without twisting. 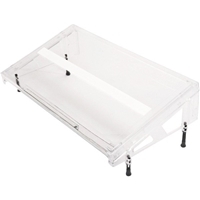 A sloped writing surface promotes safe working postures and prevents slumping. 18" ruler line guide for the Microdesk. Rubbery strip on underside for grip. Replacement side components for the Microdesk. 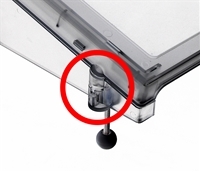 Available in the Regular angled shape for desktops, and in the Step flat shape for keyboard trays, bi-level desks, and special applications. Replacement feet for the Microdesk. Set of 4 includes 2 long feet and 2 shorter feet. Replacement bracket for foot attachment to an old-style Microdesk.